Mr. 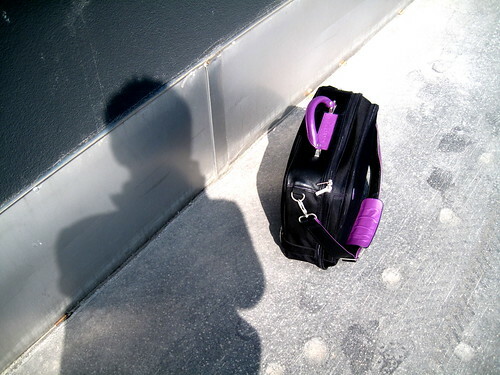 Cycle Chic - a shadow of his former self - and his Michaud bag in Vienna. What with all the travelling I'm doing of late with my Cycle Chic brand, I had long been on the lookout for practical and elegant bags. I met Matt Michaud in London last year and he showed me the prototype for his new Executive Bicycle Panniers. As soon as was humanly possible after he launched his fine product, I found it necessary to acquire a pair. Glad I did. It's a multipurpose solution. 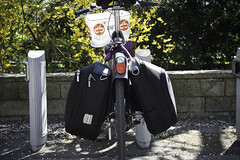 There are two pannier bags that you can attach together to carry as one or you can use just the one or the other - all depending on your needs on any particular journey. And then, of course, when you get to a bike, you can unclick them and place them handily on the back rack before cycling off. There are two bags - the executive and the leisure - and I find myself using the executive more often than not because of the well-designed interior pockets and the cool, leather laptop sleeve. The bags ooze with quality and the interiors are laced with purple satin which is just fantastically elegant. The pannier hooks are cleverly hidden away when you're not on a bicycle - can't go around looking like a bike geek, now can we? - and even when both bags are attached I've always managed to take them as carry on baggage. On smaller planes with narrower overhead luggage compartments I just unclick the two bags and place them side by side. God, I like exquisitely-designed AND practical products. I know that I am eternally sceptical about anyone who tries to sell people 'bicycle clothes/gear' but the Michaud bags are a practical addition to my travelling life. The fact that they can be used on bicycles is a practical solution, too, but it has the added value of sending a positive signal when you show up somewhere as the founder/owner of Cycle Chic or The Danish Bicycle Ambassador. As a rule I end up on a bicycle in the cities I am invited to and being able to take my bag(s) with me is quite important in many cases. Here's my bag(s) in use on a my recent trip to Vienna. On the first day I had only the one with me and that hung on the front basket just fine. 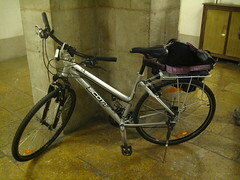 On the second visit to the city I had both bags and the Vienna City Bikes don't have back racks - just a plastic shield around the rear wheel, so I just hung the bags over the plastic. Worked like a charm. 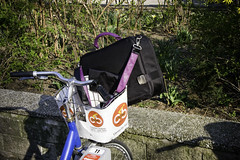 In Lleida, Catalunya, where I was at a Cycle Chic event and bicycle conference last week, the bag found it's spiritual home on the back rack of the bike I borrowed. As it also did on the bike I rode in Brno, Czech Republic. Sweet. Check out the Michaud Executive Pannier Bags on Matt's website here. Cycle Chic approves. wow! 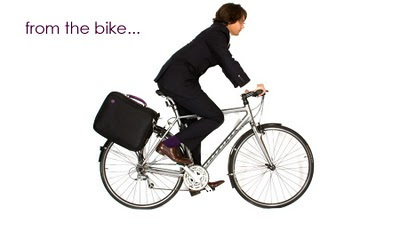 carrying heavy loads, can that cycle will not get flat? I like the color of that bag. Color violet is rare. Is that a Dahon you're pedaling? I've been obsessing about Dahon's recently - ever since you Barcelona video clip of earlier this week. 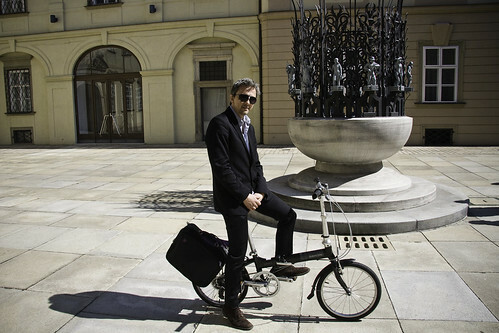 The pale blue Brompton you were on in that video was truly sweet but I can't seem to find it anywhere.